Film Screening AAAFNRAA – Making of “The Yellow Shark” (30 min, Germany 1992). Free entrance with ticket for the concert at 8pm in the Great Hall. In conjunction with the 2017 San Francisco Bay Flyway Festival, re:sound presents an afternoon of sound and video featuring artists form the San Francisco Bay Area. Jorge Bachmann, Kevin Corcoran, Jen Boyd, Daniel Blomquist and John Davis playing in dedication. The Hot Air Music Festival presents its first ever preview concert, Heating Up, featuring performances by the Guerrilla Composers Guild, Ignition Duo, and Lazuli String Quartet. The Electro-Acoustic Piano (EAPiano) is an ongoing project which supports and promotes new works for piano and electronics. Started in 2009 by Keith Kirchoff, the project has so far commissioned over thirty different composers and has been presented throughout the United States, Canada, Mexico, Belgium, Germany, New Zealand, Australia, and England. In addition to many Universities and Colleges, EAPiano has been featured as a part of the SEAMUS festival (Society of Electro Acoustic Music in the United States), ICMC (International Computer Music Conference), Festival International de Musique Actuelle de Victoriaville in Quebec, and the Festival Internacional de Música Contemporánea in Morelia, Mexico, and has hosted two international composer competitions in collaboration with the American Composers Forum (in 2014) and the University of Toronto (in 2011). The first album in the EAPiano series was released in 2011 on the Thinking outLOUD Records label. The music of the Ian Carey Quintet+1 is a fresh blend of swinging and inventive jazz deeply influenced by the contrapuntal textures of modern chamber music. It aims to blur the lines between improvised and composed material in order to create an atmosphere of unpredictability and surprise, as well as to blend the spontaneity and swing of modern jazz with the dense harmony and counterpoint of Carey’s favorite chamber composers, such as Hindemith and Stravinsky. The group (featuring Kasey Knudsen, Adam Shulman, Fred Randolph, and special guests Steven Lugerner and Hamir Atwal) will be performing original works from their acclaimed CDs, including 2013’s “Roads & Codes” (4-1/2 stars -Downbeat Magazine) and last year’s “Interview Music,” featuring Carey’s four-part suite commissioned by San Francisco Friends of Chamber Music. Arnold Dreyblatt’s upcoming visit to Houston is previewed. Craig Taborn‘s new album, Daylight Ghosts, is reviewed. The massive Celebrate Ornette 5 CD/DVD release (celebrating Ornette Coleman, of course) is reviewed. 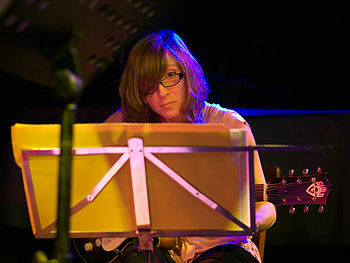 Jazz Right Now reviews Meltframe from Mary Halvorson. The new Jim O’Rourke and Jassel Jaeger album is reviewed. On Monday, January 9, 2017 within the cozy setting of the Kaufman Music Center’s Merkin Concert Hall, a number of milestones converged in a single event. The Bang on a Can All-Stars–performance ambassadors of the festival and multi-faceted arts organization that gave it its name–took to the stage to celebrate and kick off its 30th anniversary season, which also marked the opening of the seventh annual Ecstatic Music Festival and a new season of live-streamed concerts co-presented by New Sounds Live on Q2, hosted by resident new music champion John Schaefer. In accordance with the shared mission of these forces, the evening melded the presentation of new works funded by the 2017 People’s Commissioning Fund and the exploration of signature and historic works by Bang on a Can’s trio of founders, David Lang, Julia Wolfe, and Michael Gordon.